This entry was posted in ballpoint pens, reviews on March 3, 2014 by mbacas. X pen is the small pen (mini G2), Y is the medium pen (Parker), and Z is the long pen (regular G2). Article on 6061 and 7075 aluminum. This entry was posted in ballpoint pens, reviews on January 23, 2014 by mbacas. 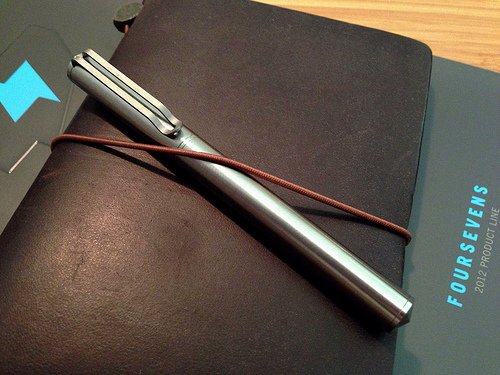 AJOTO – My latest ballpoint acquistion. This was a Kickstarter project that I backed. 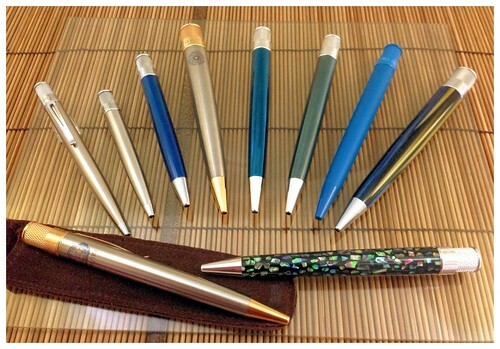 It was listed on Kickstarter as “MAKE YOUR MARK – The Pen with a Twist by AJOTO“. This was probably one of the best communicative projects I’ve been part of. For instance, they share and have pictures of the farming of the cork that is used to cradle and package the pen. They were also great in communicating after the project was funded. Eventually settling on a weekly update. This should be a standard in the Kickstarter world. Even if there is nothing new to report. Anyway here is an unboxing video that I did on my pen. I’m really impressed with the whole process. The pen is super nice. It was very “shiny”. Much more than I was expecting, but it is awesome! I also have the Bolt from Karas Kustoms in brass and the finish is very different. Not that the finish on the Bolt is bad, it’s just different. Karas is another example of having a great Kickstarter experience and I’ve backed their RETRAKT pen as well. 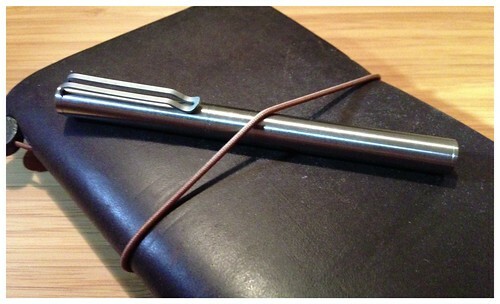 I love the shape of the pen and the way you refill it and the twist mechanism.All very cool stuff. This entry was posted in ballpoint pens, reviews on July 14, 2013 by mbacas. Since I just saw the new movie the other day I figured I’d break this pen out and photograph it, etc. You ever have one of those times where you are looking for something and just can’t find it? Maybe for weeks. Then you look behind something and voila it’s there. That’s what happened with this pen. I’ve owned this pen for quite a while. I actually had 2 of them but I think I gave one away as a present. These are laser engraved and are numbered as well. One of the cooler Fisher Space Pens that I own. This entry was posted in ballpoint pens on June 9, 2013 by mbacas. I had a chance to attend the Blade Show here in Atlanta this past weekend. It was my first time attending it. While I like knives and have a few I’m not a big collector. Nothing compared to my pen collection. While there I looking at knives I was also scouting out pens. 🙂 There were a few. Hinderer was there with quite a few of their pens. 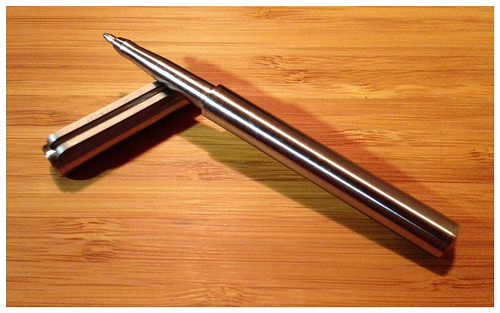 The small version of there pen looks nice, but the titanium version is quite expensive. I already have the larger version of their pen. David Broadwell was there with a few fountain pens. I saw a few other pens here and there. The one that ending up catching my eye and money was one I saw on FOURSEVENS table. These are folks that make flashlights. It nice that they are based out of the Atlanta area as well. I’ve ordered a few flashlights from them in the past and I often get them the next day. They refer to the pen as a tactical pen. While I can see that in the fact that it fits in the hand well and has a nice pointed tip (glass breaker) it is very sleek compared to most other tactical pens. That is what drew me to it. 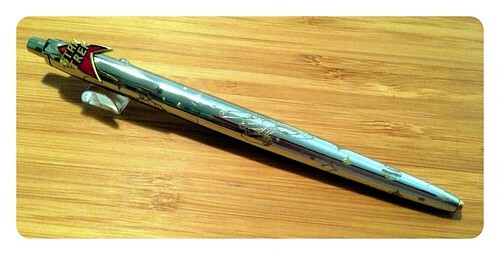 I think it reminds me somewhat of the Japanese fountain pens that I have from the 70s and 80s that are stainless steel and sleek as well. FOURSEVENS also sells different attachments for the end piece (comes with the glass breaker). You can also get a lanyard attachment (although I’m not sure how good that would be on the bottom of the pen, to me it would make more sense for that to be on the cap so you could easily pull the pen part off and use it) and they also have a strike point attachment which looks like it would be very painful to be on the receiving end of. This entry was posted in ballpoint pens, reviews on June 5, 2013 by mbacas. I’ve been listening to the pen addict podcast for a while now and one of the pens that Myke talks about is the Tornado from Retro51. I’ve actually been collecting this for a while. Here is an image of some of them. I forgot my bamboo version. Bonus points if anyone can name them all. This entry was posted in ballpoint pens on June 2, 2013 by mbacas. Well, it’s been a long time since I’ve done anything with the software running on PenPassion. I created and started the PenPassion site back on tax day in 2004. For the majority of the time I’ve used Drupal to run it. I’ve decided to convert it over to a self-hosted WordPress site. This entry was posted in site on June 1, 2013 by mbacas.